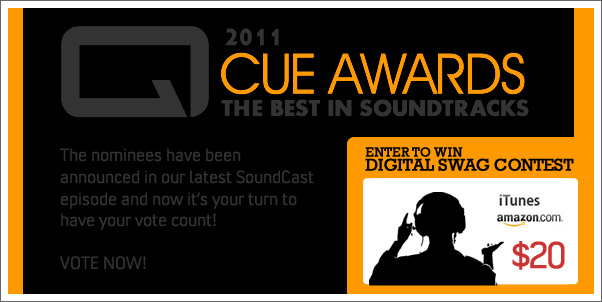 Tracksounds: Cast Your Vote in the 2011 Cue Awards and Enter to Win! Cast Your Vote in the 2011 Cue Awards and Enter to Win! The Cue Awards are back and once again YOU can take part. When you vote for this year's winners, you are automatically entered in THE CUE AWARDS E-GIFT-BAG contest! Once again, ONE lucky entrant will win a special E-Gift bag! While other Award Shows shower the attendees with great gift bags, here at the Cue Awards, YOU are the star and so You should get the gifts! $10 E-Gift Card to iTunes AND $10 E-Gift Card to Amazon.com! Entering is easy! Just rate each nominee (be sure to read the instructions on how to do this below), submit your name and email address and you'll be automatically entered into the random drawing! Ratings/contest entries will close at MIDNIGHT, MARCH 2! Winners will be notified by email on or around March 4, 2012. If you haven't listened to our nominee announcement show, check it out here!